New four story mixed use building on a corner lot in Seattle. 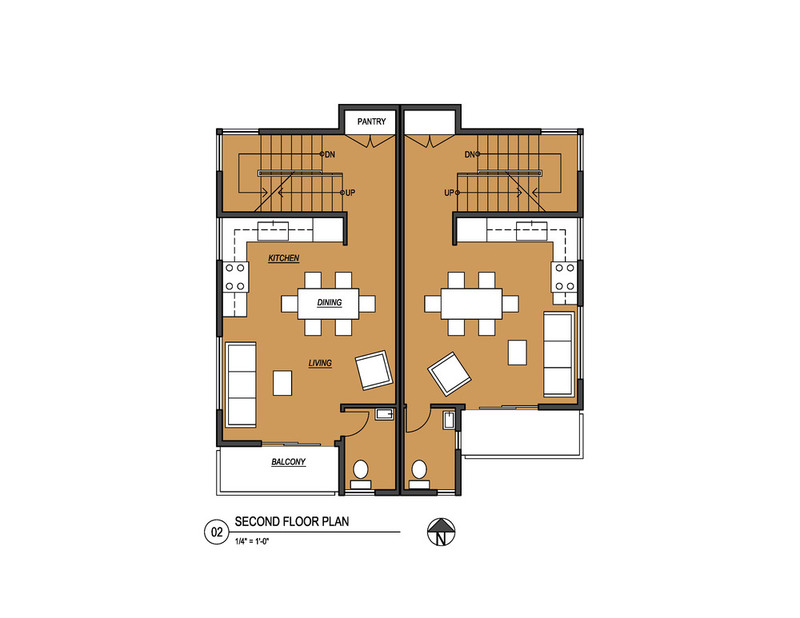 15 apartments over 2000 ft2 dental suite with 18 stall parking garage. 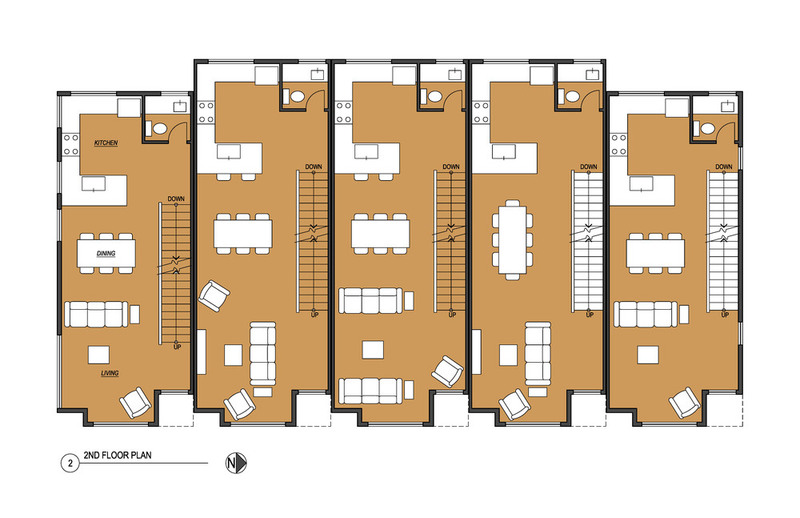 The unit mix is five 2-bedroom units and ten 1-bedroom units. Zoning is NC2-40. 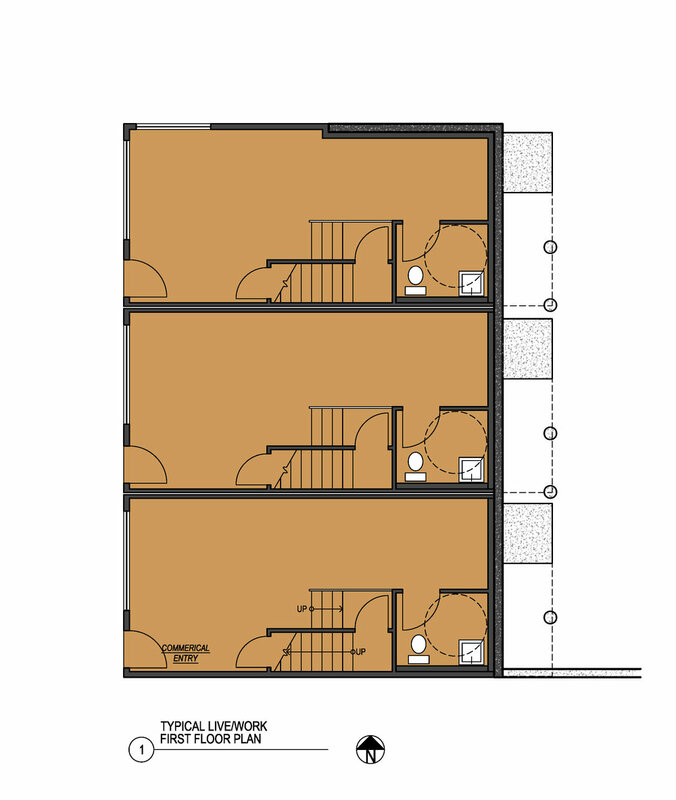 Under the pre 2007 zoning code, lot coverage was limited to 64% above the second floor, so the apartment levels are 'L' shaped with a common roof deck in the southeast quarter. The commercial level has a brick facade with a steel canopy along the sidewalk. Project survived the Design Review process intact. 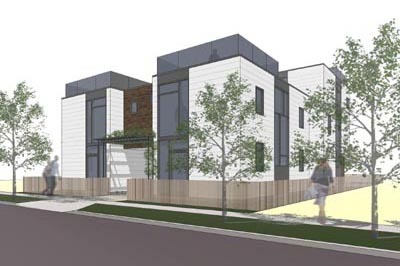 Study for new townhouse development in Seattle. 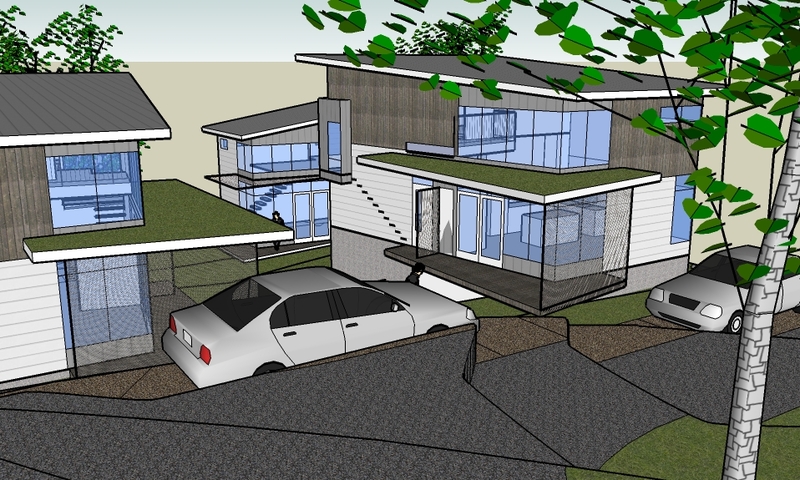 The site plan locates the driveway through the middle of the lot instead of along the side. The buildings span the driveway above the first floor. The two front units are each 3 story with 3 bedrooms and 2 bathrooms. 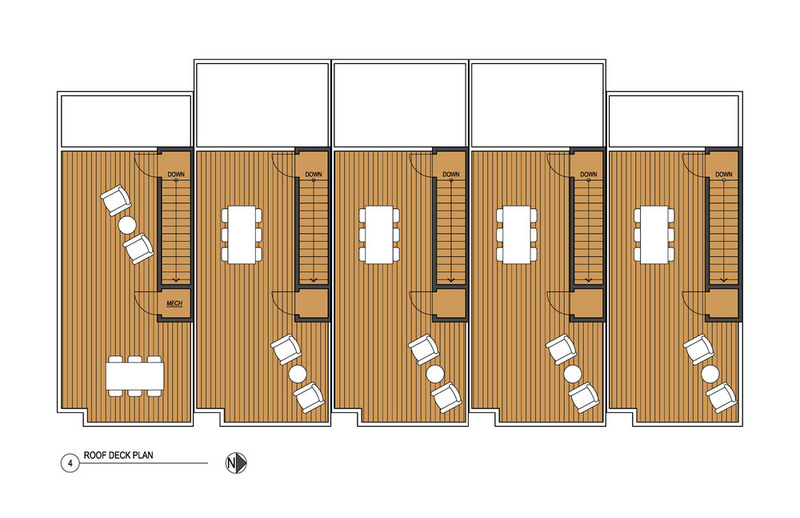 The two back units are each 2 story with 2 bedrooms and 1 bathroom. Each unit has a private roof deck. 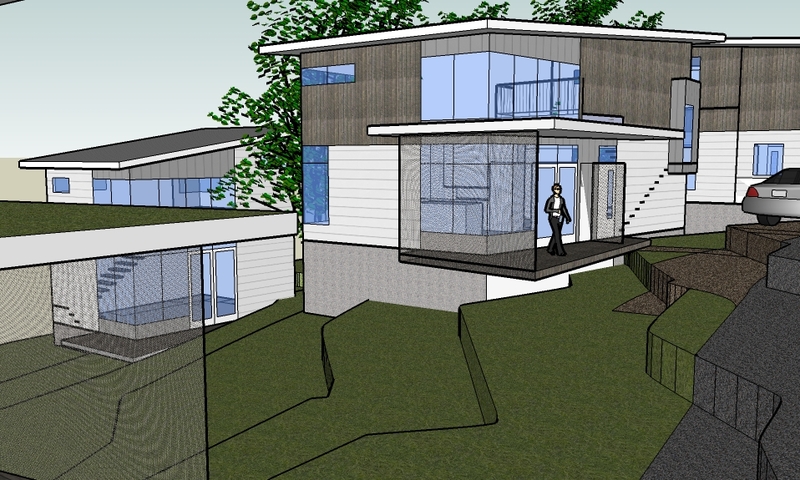 Short plat to create four single family lots in Seattle. 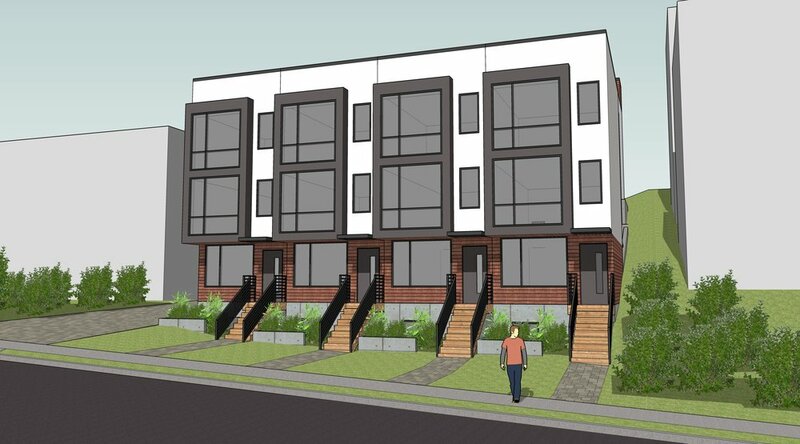 Each lot has a 2-bedroom, 1-bath house over a full basement, a 1-bedroom, 1-bath Detached Accessory Dwelling Unit, and two surface parking stalls. The site had never been built, in part because it contained a steep slope and in part because it had no street frontage. We connected two adjacent streets with a one-way driveway to provide vehicle and fire truck access. The site layout groups the new buildings into two clusters to enlarge the apparent size of the private open spaces. The project received a master use permit, but was abandoned by the owner at the depth of the Great Recession.